Error marks the place where learning begins. 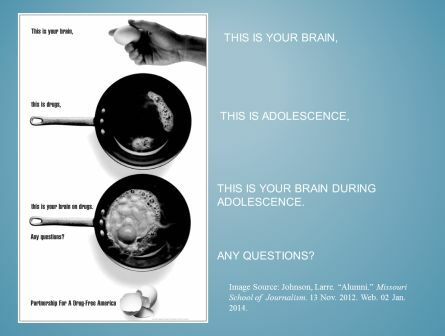 This is Your Brain on Adolescence: Any Questions? 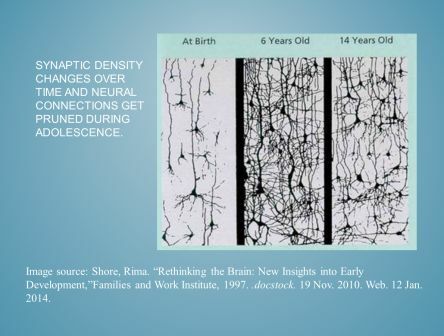 I presented “This is Your Brain on Adolescence” at the Sparta High School Teacher In-Service on January 3, 2014 & again at the Bi-County Institute in Valmeyer on October 10, 2014. If you want to just skip to the active engagement instructional strategies, go here. If you want to learn more about how the adolescent brain works, keep reading. According to the World Health Organization (WHO), “adolescence is the period in human growth and development that occurs after childhood and before adulthood, from ages 10 to 19.” Middle school, high school, and college teachers can appreciate the unique challenges and rewards inherent in working with adolescents. As a mostly-high-school-but-sometimes-college-teacher myself, I am particularly interested in the cognitive development of my students. Knowing how my students think helps me teach them to think about their own thinking. It’s not that the teens are stupid or incapable…. It’s sort of unfair to expect them to have adult levels of organizational skills or decision making before their brain is finished being built. Think about it in terms of your own education. Now, think about it in terms of your own teaching. In teens, the parts of the brain involved in emotional responses are fully online…while the parts of the brain involved in keeping emotional, impulsive responses in check are still reaching maturity. Synapses “exercised” by experience survive and are strengthened, while others are pruned away. if a teen is doing music or sports or academics, those are the cells and connections that will be hard-wired. If they’re laying on the couch or playing video games or MTV, those are the cells and connections that are going [to] survive. When I was signing up for my classes sophomore year, I vividly remember all of my high school counselors telling me: “You need to know what you will be when you grow up!” I always thought guidance counselors were being uber-overly-dramatic; according to brain research though, they might be right. So, students in high school vocational programs might be more competitive in the job market later on because their brains are learning as much as their hands are. Adolescent athletes are mentally honing skills because their brains are working just as hard as their bodies during practice. English students are getting more English-y, science students are getting more science-y, math students are getting more math-y, art students are getting more art-y, and no wonder Spanish was tan mas facil to learn when I was 16 than it is to remember now! There is a lot of information about how the brain works. One of my favorite sources for learning about the brain has been Radiolab. Oliver Sachs, the doctor behind Awakenings, is a constant contributor to the show. You can listen to how music affects the brain in this podcast called “Musical Language.” The whole episode is worth listening to and is a great introduction to the program. However, if you want to hear the sound of synapses firing, which I discussed during my presentation, go to roughly the 8:30 mark in the “Sound as Touch” segment. I love playing this segment for my students – it discusses how and why audiences rioted when they first heard Stravinski’s The Rite of Spring in 1913…among other things. Recognize that there is an emotional connection in learning. If students think you care and are invested, then they will care and be invested. Also, be aware that they can’t always control their emotions and don’t always know why they make the choices they do. Recognize there is a physical connection to learning. The brain essentially uses glucose and oxygen as food. Adding kinesthetic activities to instruction circulates oxygen and glucose in students’ brains, increasing the efficiency of student learning. Plus, moving around & talking are WAY more fun than taking notes. Recognize that learning happens when we graft new ideas onto old. According to John Bruer, your “prior knowledge is the best predictor of how quickly and well you will learn.” Find out what your students already know. This means getting to know them as more than just names in a gradebook. If we want our students to be meta-cognitive, then it makes sense for us to start thinking about thinking too. “The Teen Brain: Still Under Construction.” National Institute of Mental Health. National Institute of Health. 2011. Web. 2 Jan. 2014. Bruer, John. Frontline Interview. Inside the Teenage Brain. 2002. Web. 2 Jan. 2014. Dearborn, Grace. “Rebels with Applause: Brain-Compatible Approaches for Motivating Reluctant Learners.” Conscious Teaching. 2013. Web. 2 Jan. 2014. Giedd, Jay. Frontline Interview. Inside the Teenage Brain. 2002. Web. 2 Jan. 2014. Johnson, Larre. “Alumni.” Missouri School of Journalism. 13 Nov. 2012. Web. 02 Jan. 2014. 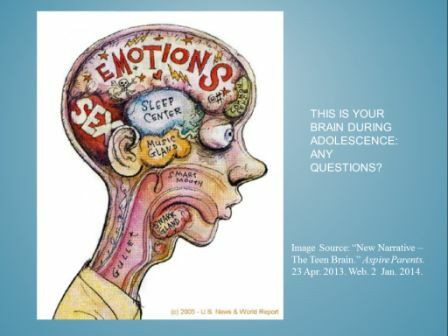 “New Narrative – The Teen Brain.” Aspire Parents. 23 Apr. 2013. Web. 2 Jan. 2014. Shore, Rima. “Rethinking the Brain: New Insights into Early Development,”Families and Work Institute, 1997. .docstock. 19 Nov. 2010. Web. 12 Jan. 2014.